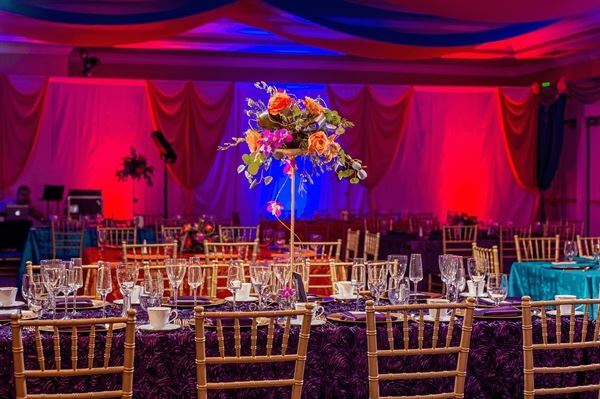 Temeku Hills Ballroom is a beautiful venue perfectly suited for a wide variety of events. Versatility of this venue and our professional event services will help make your event vision a reality, no matter the occasion. Our tastefully decorated ballroom accommodates up to 325 for banquet seating, and outdoor spaces are also available. We provide services for planning a destination wedding, cocktail receptions, an anniversary celebration, fundraiser or graduation party, including banquet and catering service, bar service, and event planning. Our expertise is at your disposal, and we look forward to assisting you. We'll gladly customize our services, from menus to decor, to help make your event vision a reality. Admin/Service charge and California sales tax will be added to above prices. Prices are subject to change until booked. Admin/Service charge and California sales tax will be added to above prices. Prices are subject to change until booked. $2,500 is required to book your event and confirm your date. Up to one hour set up time and one hour tear-down time are provided at no additional charge. Additional time can be arranged in advance, and is based on current published venue rental rate. All regular guidelines and restrictions for use of the Ballroom apply. Alcohol is not included in this package. A variety of bar service packages are available. Contracts for Venue Rental and for Catering will be prepared for client approval. Reservations are first come, first served. No additional discounts may be applied. Availability is not guaranteed. Bar/Bat Mitzvah, Birthday, Debut, Quinceanera, Sweet 16 Celebrations! Our Celebrations! Package is a great place to start when planning your special family celebration. Details Celebrations! includes: Up to four hours of event time in the ballroom or the courtyard Banquet chairs, guest tables, check in table, gift table, cake table Floor-length linens, in your choice of color Linen napkins in your choice of color China, flatware, glassware Dance floor Wait staff Full custom dinner menu, attended buffet* *Your choice of Mexican Buffet, or Italian Buffet, or Custom Buffet Beverage station: Strawberry lemonade, citrus-infused water, coffee Special venue rental fee = $2,800++ plus $250 Custodian fee; plus Catering prices: $43.95 per person++, 100 to 150 guests $41.95 per person++, 201 to 320 guests $39.95 per person++, children 10 years and younger ++20% service charge and 8.75% CA sales tax will be added to the above price. Enjoy the comfort and elegance of festively decorated ballroom, and make your holiday planning easy, whatever your style: simple, casual, elegant or upscale. Our Ballroom will be festively decorated for the season. Special requests are our specialty: we are happy to customize your menu and event services. Our Holiday Celebrations includes: Holiday dinner buffet, starting at $43.95 per person* Seasonal decorations in lobby and Ballroom Iced tea or lemonade, citrus-infused ice water Regular and decaf coffee Gold or silver chargers Guest table linens, floor length Choice of linen and napkin color Ballroom chairs Complimentary parking *Dinner Buffet Prices are per person, based on 75+ guests. Prices are subject to 20% service charge and 8.75% CA sales tax. Other Pricing details: Venue fee for up to four (4) hours of event time: Monday – Thursday: $2000, Friday – Sunday: $2800. Additional time may be added if arranged in advance at the pro-rated hourly rate. Dinner Buffet Prices are per person, based on 75+ guests. Prices are subject to 20% service charge and 8.75% CA sales tax. Please contact us for complete terms & conditions. Atmosphere/Decor: Classic California ambiance, low-key tasteful decor is suited to a wide variety of events. The neutral color scheme lends itself to customization, especially through the use of lighting effects.